The Optimus 4X HD uses the standard Android ICS gallery. It automatically locates images and videos no matter where they are stored. By default, images are sorted by albums, but you can sort by location or time as well. The music looks similar to the typical ICS version we're all familiar with. It can do the usual filtering by album and artist and you have alphabet search and regular search for finding songs quicker. The Now playing interface places a big album art image in the center with controls above and below it. Swiping the album art left or right is the easiest way to skip songs back and forth. 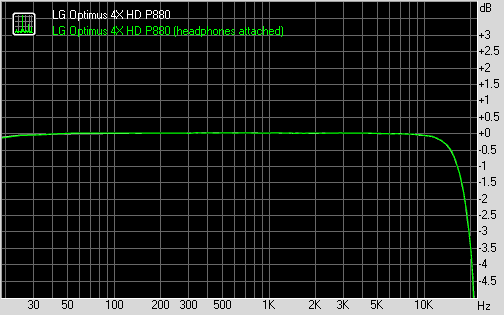 There are equalizer presets which become available when you plug in a pair of headphones. There's an FM radio on the LG Optimus 4X HD, which can play over a set of headphones or the loudspeaker, but the headphones need to be plugged-in either way (they act as an antenna). You can also scan for radio stations, and save up to 48 channel presets. There is no RDS support though. Unfortunately, the LG Optimus 4X HD audio output turned out pretty bad and is nowhere near what you would expect from flagship smartphones. Even when connected to active external amplifier the LG Optimus 4X HD could only achieve mediocre scores on most readings with the good frequency response and stereo crosstalk the only exceptions. The volume levels were way below average, too. The picture didn't really change when we plugged in a pair of headphones. Even more distortion crept in, the stereo crosstalk worsened (although not by too much) and most of the other readings were affected too. The LG Optimus 4X HD overall results are so bad that they made us suspect our review unit had some issue. We'll try and get another unit and repeat the test and we'll update this article if necessary. The interface during playback is nothing overcomplicated either, yet it's quite powerful - in fact the video player was the focal point of most of the custom features developed for the LG Optimus 4X HD. To get the basics out of the way, the available controls during playback include a scrubber for jumping to various parts of the video along with the standard play/pause and skip buttons. There's a Dolby Mobile toggle as well. One of the new additions is a Video Speed control (you can set values from 0.5x up to 2x). A feature called Fingertip Seek lets you jump back and forward to specific parts of the video. Previews of video frames are displayed without interrupting the actual playback. There's a lock button too, which hides all controls for pure full-screen viewing. Another new feature in the video player is Live Zooming. You can zoom in (with a pinch) during actual playback and we mean some serious zoom length, not just a quick resize or fit to screen. This is not where the new video player perks end. An arrow on the left (in landscape) pulls a mini drawer with all the available videos. It takes half of the screen, with the currently playing video still running in the other half. You can click on any of the small thumbs and the video will play in its tiny window, giving you a live preview of sorts with the main video also running. This is LG's reply to the live video thumbnails in the Samsung Galaxy S III's gallery. 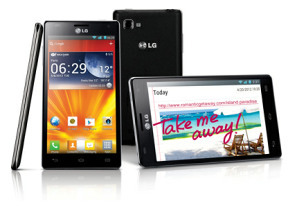 The LG Optimus 4X HD handled everything we threw at it - DivX, XviD, MKV and MP4/MOV up to, and including, 1080p resolution. The AC3 audio codec (among lots of others) is supported, so you don't have to worry about the sound either. There are no limitations for the bitrate, file size, etc.